Like snowflakes, fingerprints, and retinas, every cell has a unique personality. Whether wandering through the bloodstream as solitary nomads or gregariously congregating in tissue, each cell has a unique story to tell. 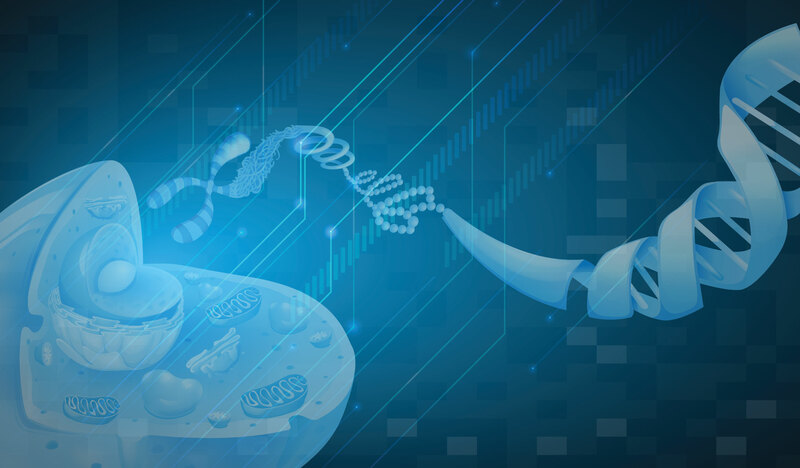 Single-cell genomics helps obtain and write those complex biographies, yielding insights into normal cell dynamics, and provides information about when cells go rogue and turn into tumors. Single-cell genomics, a field still in its infancy, captures genome-wide data at the resolution of individual cells. With its ability to depict thousands to millions of individual cells at once, the potential is enormous for shedding new light on fields such as immunology, neurology, and cancer. However, a common challenge of heterogeneous systems is that they often contain massive numbers of cells. For example, a centimeter-sized tumor can consist of hundreds of millions of cancer cells. Additionally, each cell has only a tiny bounty of DNA, making it a challenge to accurately amplify and sequence individual cells. Despite these limitations, innovative technologies and platforms are being developed to not only enhance throughput, but also to quickly evaluate the vast datasets generated. Recent meetings, such as the Precision Medicine World Conference and SelectBio’s RNA-Seq, Single Cell Analysis & Single Molecule Analysis conference, present new forums to discuss this young and exciting field. Some approaches are employing microfluidics in the form of nanodrops to encase cells or microfluidics chips with gel beads containing bar-coded oligonucleotides. Another emerging field is the use of cell nuclei for single nuclei RNA-seq. The latter can avoid the harsh treatment to separate or lyse whole cells that have the potential to alter gene expression. Also on the horizon are computational pipelines and visualization tools for efficiently processing million-cell datasets. Earlier methods examining gene expression usually averaged all the transcriptomes obtained from bulk tissue. This global snapshot necessarily lost vital information at the single-cell level. While recent advances enabled mRNA-seq analysis of individual cells, technologies could only examine a few hundred cells at a time. Additionally, cells often first needed separating by flow cytometry or microfluidics. Dolomite Bio has developed a microfluidics platform that enables the Drop-seq protocol (Figure 1). Dr. Breteau explains, “Our technology allows highly parallel genome-expression profiling of cells using nanoliter droplets. Thousands of cells can be individually captured in these droplets. Inside the droplet, and within only a few minutes, the individual cell is lysed and its mRNA captured on uniquely barcoded oligonucleotides attached to beads. After recovering the beads, they are subjected to reverse transcription, library preparation, and finally sequencing” (Figure 2). Figure 1. Dolomite Bio has developed a process that uses nanoliter droplets to encapsulate individual cells along with mRNA capture beads (circles with squiggly lines). The process, which enables high-throughput single-cell RNA sequencing, consists of the following steps: Separate suspensions of cells and beads are combined before being dropletized in oil on a microfluidic chip. Inside a given droplet, an individual cell is lysed and its mRNA is captured on a single, uniquely barcoded bead. The droplets are broken, and the mRNA-coated beads are recovered. Subsequent reverse transcription produces bead-bound single-cell libraries that are uniquely barcoded by the cell of origin. As an example, a cell suspension can be loaded into an agitated remote reservoir and beads injected. Droplets are then collected in an output reservoir at ~2,800 droplets per second. Within a 15 minute run, more than 6,000 single-cell libraries can be generated. Figure 2. 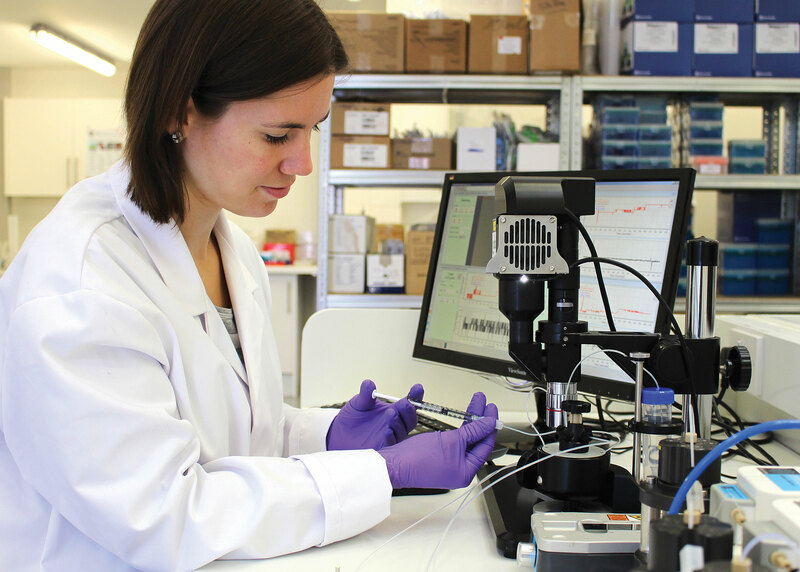 Muriel Breteau, Ph.D., a technology applications specialist at Dolomite Bio, injects barcoded oligonucleotide-coated beads into a single-cell RNA-sequencing system. The system, which incorporates the company’s scRNA-Seq chip, captures mRNA from lysed cells. Once the mRNA is encapsulated in nanoliter droplets, genome-wide expression profiling at the single-cell level may commence. Single cells, reverse transcription reagents, “gel beads” containing barcoded oligonucleotides, and oil are combined on a microfluidic chip to form reaction vesicles called “Gel Beads in Emulsion,” or GEMs, which are formed in parallel within the microfluidic channels of the chip, allowing the user to process hundreds to tens of thousands of single cells in a single seven-minute Chromium™ Controller run. Another important single-cell application is the characterization of paired T-cell receptor alpha and beta chains in tens of thousands of T cells. This application allows comprehensive immune repertoire profiling, for determining which functional subsets of T cells have undergone clonal expansion. Dr. Zheng believes this will be especially valuable in areas of infectious diseases and immuno-oncology. Cells of the central nervous system are particularly difficult to isolate as intact whole cells. Neurons are highly interconnected with axons and dendrites. To separate them by physical means often causes considerable damage. Further, proteolytic degradation of surface proteins to dissociate whole cells from tissue may stress the cell sufficiently enough to alter gene expression. With the fast-paced progress developing in single-cell genomics, it is no surprise that instrumentation is expanding in parallel with applications. BD Genomics, a division of BD (Becton Dickinson and Company), recently presented information on their current and emerging platforms and applications for single-cell genomics and how they have begun to apply these to the study of solid tumors and liquid biopsies. Figure 3. 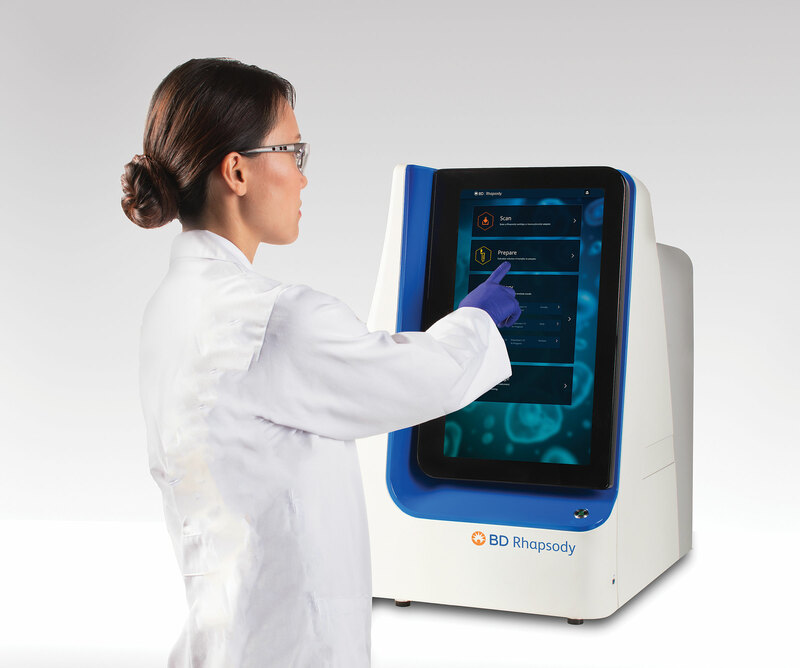 The BD Rhapsody, from BD Genomics, can enable digital quantitation of hundreds of expressed genes across tens of thousands of single cells in parallel. To accomplish single-cell capture and molecular indexing of mRNA transcripts, BD Rhapsody uses magnetic oligonucleotide barcoded beads. These beads are then pooled into a single tube for cDNA amplification and library construction. BD Genomics says that users will be able to multiplex many samples in one run with a single-cell multiplexing kit, significantly increasing sample throughput while maintaining the low doublet rate. Further, in collaboration with clinical researchers at leading academic medical centers, the company is developing a system for rare-cell enrichment based on magnetic depletion and acoustic focusing. This cell-enrichment system is placed upstream of a traditional BD FACS sorter to enable circulating tumor cell capture for downstream single-cell genomics.